One of my friends called me in a worrying voice telling me he had received an email from Income tax department with subject “Intimation U/S 143(1) for PAN ABCxxxxx4A AY:2019-20”. As with most of us, any communication from taxmen makes us worried and it was not much different for my friend. Are you in the same boat and have you also received similar email from [email protected] with similar subject? And are you worried about what it means for you? 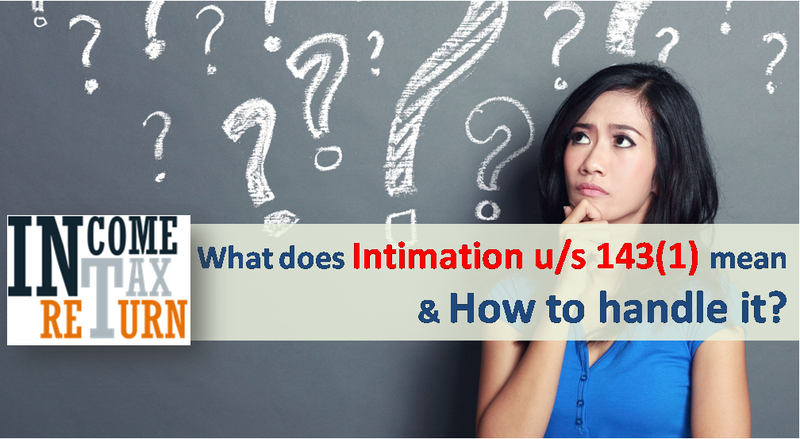 What does Intimation u/s 143(1) mean? Well worry not! Intimation U/S 143(1) is sent by Income Tax department in response to the Tax returned filed by you. As the subject suggests “Intimation” – the communication intimates the tax payer about, any tax and interest payable or if you are eligible for refunds. What you need to do is open the attached zip file. The zip file contains a PDF file which is password protected. To open this PDF following is your password. The password is your PAN Number in lower case followed by your date of birth in DDMMYYYY format. So if your PAN Card Number is ABCDE1234A and date of birth is January 1, 1985, then your password would be abcde1234a01011985. The date of birth should be one which is mentioned on your PAN Card. Just scroll down and at the end of all calculations you would see two headings. In case there is ‘0’ in front of both as in the picture above, it means that your tax return filing was perfect – you neither need to pay any more tax for the year nor you would get any tax refunds. Also Read:Tax Notices You can get and What to do about it? In case some amount is mentioned for “Net Amount Refundable” then its good news and you would soon get that amount in your bank account. And if “Net Amount Payable” has some amount mentioned, then you need to pay that much tax to Income tax department. In case you think there is some error in the calculation sheet, you should consult a qualified CA or good tax expert for further action. Tax payble is showing some amount but net amount payble is zero. What i need to do? I have got an intimation u/s 143(1)saying Tax Payable Rs.1. What should I do, can see anything under “Response under outstanding tax pay” ? As per the above mentioned Details, I have checked the Net Amount Refundable & Net Amount Payable in attached PDF File and it is mentioned as net amount Refundable is 14480 and net amount payable is 0 So what should I do now?? Intimation U/S 143(1) for PAN BJSxxxxx7L AY:2018-19 I have received from CPC .my TDs is file to 12657 but refundable is 12870..and payable amount is 0. I do not under stand what can I do. What can I do for mismatch. So, do we have to do some rectification or just leave it as it is? Because just like the above person, the amount I filed is lesser than the amount calculated by cpc due to interest they had calculated. I’m confused about what I’m supposed now. Pleassw guide us. can I submit ITR of the assessment year 2017-18 with any due date fees or anything? Sir, i have filed my ITR on 31.03.2018 of FY 2016-2017. I am Defence pensioner. In FY 2016- 2017 i have received some arrers of OROP and other arrers . For that SBI has deducted the TDS of Rs 47398 from my paid arrers and pension. But deducted TDS full amount not seeing to my PAN. Now on 03.08.2018 i have received on SMS from Income Tax Department CPC saying that ” your Itr has been processed CPC and Order u/s 143(1) will be sent to you through e-mail” but nothing has been received tiil date. So please suggest & advice to this defence pensioner please. The Resolution of my grievance is pending from Income tax department. Instead of writing my PAN No. my employer wrote someone else PAN No. for the correction of PAN No. i wrote application to Income tax department and I was given assurance by them that the problem will be resolved soon but till date status is same and 2 week back I got letter from [email protected] they are asking me again to pay the tax of the previous FY with interest. I tried to reply but i am getting Faliure Delivery. What I know is as your employer had made wrong data entry, you should approach them to get it corrected. Also you can speak to income tax helpline numbers. Actually that amount I got as interest for FDs from bank. Please clarify me. I try to do the process through eproceding. But not clear that how to upload the XML in India e-filing site. Do I have to pay the amount? Received intimation 143 U/S (1) – stating Amount Refundable (extra 10 rs). Do I need to do any action like rectification request etc. I have submitted my revised IT return with e-paying the remaining tax. What to do next. How to pay the remaining tax as the revised return is already verified. If there is tax due please pay it an file a revised return! Hi, I have received the same Notice 143(1) with tax payable as 4010 but during filing my returns, it was calculated as 4050 and I have already paid the same amount just after submitting my return through e-pay. Should I react for this intimation in any form or does it mean my e paid tax is not considered and they are asking me to pay 4010 again? How to respond to this Intimation, Please help..
You should ideally file returns after you have paid all your taxes. You can reply to the notice saying that tax due has already been paid. Please find attached the Income tax Intimation U/S 143(1) for PAN AxxxxxxxxG with respect to the return of income filed by you for the Assessment Year 2017-18. As per the above mentioned Details, I have checked the Net Amount Refundable & Net Amount Payable in attached PDF File and it is mentioned as 0 in both places, So do I have to worry about the intimation or not. I have received an intimation to Pay Rs. 10. Where do I find the link to pay that amount on which website and in which link under that website, please explain. Hi, I got this mail 6 days back but still haven’t received the refund. Upto how much time can it take? TIA. My salary is 12lkhs per yr including all incentives and I’ve 2 LIC policies for 60K and rental receipts of 96000. I would like to know what would the taxable income? What can be my total deduction for IT? How much i can expect in returm from ITR?